Chopin's Piano Sonata No. 3 in B minor, Op. 58 represents, quite possibly, the crown jewel of the composer's innovative and much-debated achievements in large-scale musical structures. A sweeping, tumultuous and, ultimately, uplifting grand pianistic gesture, the work is exceptional not merely for its overflowing abundance of ideas but for the adroit ingenuity Chopin displays in creating, out of these, a fulfilling and cohesive whole. With their most recent releases, two of today's most revered keyboard virtuosi have risen to meet the immense challenges posed by Chopin's masterpiece. There are marked similarities between the careers of Russian-born Nikolai Demidenko and French-Canadian Marc-André Hamelin. Born within four years of each other, both men have 'grown up' together on the musical scene and now perform regularly on these shores at the Wigmore Hall and in the South Bank Centre's International Piano Series. They also share a fondness for the unfamiliar, with Demidenko often performing little-known works by canonical musicians and Hamelin recording swathes of music by previously neglected composers. The parallels, however, end here. It is clear from the outset that these are two very different performances, with nearly four-and-a-half minutes' disparity between them. Hamelin is known for his ability to reach astounding speeds at the keyboard, and his unsurprisingly up-tempo approach to this sonata creates a rare sense of lucidity and organicism, particularly in the outer movements. The passage of rising bass semiquavers at 0'49 in the opening Allegro maestoso, for example, tenderly tumbles forth in a manner akin to a liquid gently overflowing from a glass. Such swiftness can also have its downsides, though, and Hamelin's playing does sometimes verge on the mechanical, in danger of sounding emotionally detached. The Largo offers a snapshot of these pros and cons, with rather matter-of-fact outer sections sandwiching a fluid and highly atmospheric central episode. On balance, however, this is an outgoing, edge-of-your-seat rendition of the sonata with far more virtuosic thrills than emotive spills, supported by wonderfully sympathetic recorded sound. The extra time that Demidenko takes is certainly not a result of inferior virtuosity, as some of his ferocious semiquaver passages in the Finale easily match those of Hamelin for bedazzlement. What we have here is a broader, more capacious interpretation, one that proudly retains the maestoso in Allegro maestoso. The second-movement Scherzo is particularly brilliant, subject to a charming dance-like characterisation as opposed to being tossed aside like a leggiero etude. Whilst the more relaxed tempi facilitate a more delicate account, they also test the pianist's powers of sustainability. There are times of striking expression – such as the recapitulation in the Largo – but other moments when the music begins to sound a touch laboured. Demidenko also displays a somewhat peculiar yet beguiling propensity for idiosyncrasy, with some highly distinctive rubato in the Finale and an extraordinarily measured approach to the same movement's introductory fanfare. 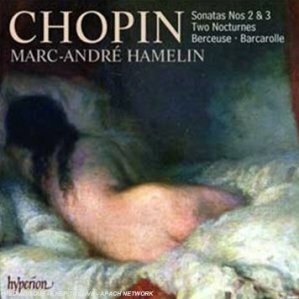 Aside from Hamelin's gregariousness and Demidenko's introversion, what most separates these performances are the former's willingness and ability to convey the vast melodic potential of Chopin's bass and inner lines. The first and last movements are particularly noteworthy for these countermelodies, which Hamelin elucidates with revealing perception and sensitivity. Furthermore, Hamelin's thunderous, tam-tam-like final return to the principal theme (at approximately 3'22) is one of the most utterly spine-tingling moments I have ever heard on disc (who cares if he adds an extra bass note to accomplish it!). Whilst this may well tip the balance in Hamelin's favour, however, neither pianist – in this reviewer's opinion – quite manages to achieve the majestic grandeur and expansive phrasing of Emil Gilels' 1978 version (available on DG 477 6625). Both pianists generously fill their discs with over seventy-five minutes of music. Demidenko's Third Sonata appears alongside a fascinating account of the twenty-four Preludes, Op. 28. Fascinating, that is, because this is an exploration not of the composer's lyricism but rather his overall pianism. We all know and love Chopin the melodist, and there are times during this collection of miniatures when one might wish for a greater inclination towards cantabile playing. 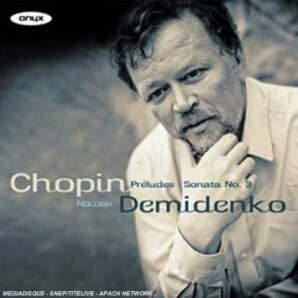 However, Demidenko's ardent focus on Chopin's manipulation of texture allows him to create richly varied soundworlds which, in turn, emphasise the uniquely diverse nature of this music. This is certainly a performance well worth seeking out. In Hamelin's case, the Third Sonata serves as the thrilling conclusion to a well-crafted Chopin recital. This includes the composer's previous work in the same genre – in B-flat minor, Op. 35 – its movements once famously described by Schumann as 'four unruly children' disguised under the collective 'sonata' cognomen. The performance here is quite captivating, especially during the fireworks of the second-movement Scherzo and the superbly-crafted turbulence of the Presto finale, though it sometimes lacks the textural clarity that makes the account of Op. 58 so enlightening. Hamelin does, however, give us sublime lyricism in both the second subject of the first movement and during the central section of the brooding Marche funèbre, a strength which is beautifully exhibited in the other works presented here. The Berceuse, Op. 57, is the ideal opening gambit, performed with a wistful juxtaposition of agility and gentility. Affectionate simplicity abounds in the Two Nocturnes, Op. 27 before a breathtaking navigation through the Barcarolle, Op. 60, which is perhaps the single most impressive performance on either disc.